Inter club league software, In-house round robins, tournament draws, Box Leagues your coordinators and captains manage their programs. Perfect for Tennis, Pickleball, Team tennis, racquetball, College and High School leagues. Captains and co-captains can enter match results. League standings… optional methods to calculate. Ratings calculation using our DCTR (Dynamic Computer TopDog Rating) proprietary algorithm. USTA licensed this algorithm. Captains can create their match lineups and email to their players. Send automatic match reminders to team’s roster. Individual player profile show all registered teams and all matches played. Also ratings, availability, scheduled matches..etc. and most importantly, easy setup. TopDog also offers a ratings calculator, which if turned on will automatically analyze match statistics to update player ratings. 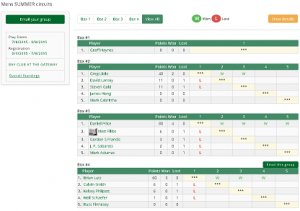 TopDog Sports can generate various scorecards based on league preferences. Club day, evening round robins and Box Leagues are also available. They can be designated as singles, doubles with fixed partners or doubles switching partners, and the system can also automate match scheduling. Our Tournament Management software allows the tournament director to create and manage tournaments online. 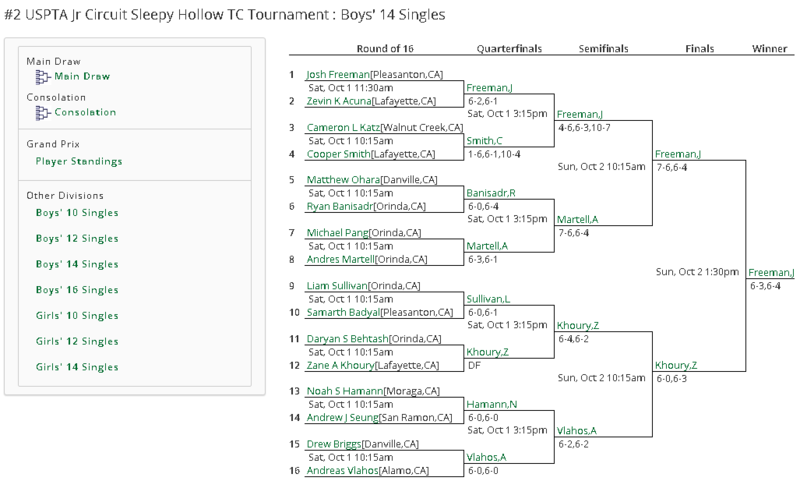 Schedule matches and create Single Elimination, Consolations, round robins and Compass draws (brackets). Invitations and follow ups can be sent to all players who are in the database, directly from the tournament dashboard. Online registration allows players to signup online, and use social media to share the tournament with their network. The tournament director will receive notifications allowing them to view the applicants, and organize the draw (bracket), which is posted to the system and sent to directly player’s email. 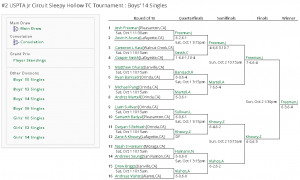 This tournament software can be used for many sports like Tennis, Pickleball, Paddle tennis, Padel, Ping Pong Etc. The challenge ladder management program allows players to join a ladder, contact each other via email, challenge them, and report the scores online. The system analyzes the results and rearranges the player rankings automatically. We also enable player profile views directly from the ladder page, which provides valuable information for players looking to challenge opponents of a certain level. Give players the option to manage their own court reservations according to the facility’s availability. No more hours spent on the phone with a pencil and paper dealing with availability logistics. You can also run reports to learn which members are using your facilities, and determine the best times for camps, clinics, or practices, based on usage history. From the dashboard, organizations can customize the system to use standard ‘Court’ reservations or ‘Time’ based reservations. Real time court booking means players will never wait for a court again. Box leagues are a great way to keep players motivated to play their matches. The way it works is simple, the administrator assigns players to a box based on their rating or ranking. Players are broken into groups of 4-8 depending on the total number of participants. Each group is a “box” that plays a mini round robin among the other players in the same box. At the end of the season the top players move up a box and the bottom players move down a box. Then the league starts over again. Scheduling is completely flexible and is entirely up to each player. Quickly create Round Robin schedules for your club events. Works for all sports, including tennis and pickleball. Keeps track of league standings, players can enter matches results online. You can also setup reminders and confirmations for your players. Creates schedules for Singles, fixed partner doubles or switch partner rotation doubles. This program will schedule round robin matches, avoid court conflicts. Great for tournaments too. This wizard will help you create player match schedules. It’s great for Tennis, Pickleball, Squash, Racquetball, Volleyball and team sports. You can choose the number of courts, number of rounds and start time for your event. The Wizard will optimize the match-ups so that players are all treated as equally as possible. We also just have a free scheduler that we don’t charge any money for the use of this Scheduler. Schedule Play makes it easier to manage your player groups (group of friends, lessons, clinics, teams, etc.). No more “no-shows” and last minute phone calls searching for subs. Schedule Play automatically sends email/text reminders to the members of your group. If necessary, your players can find a sub using the list of available players. Your subs receive an invitation. They can then indicate if they want the available spot. The sub doesn’t even need to login to accept the invitation, making it easier to fill the player’s spot. Player’s can indicate their availability so you know who is available when doing the schedule. Make registration available to your group. Make a round robin match schedule of the players coming. Record scores and keep standings. Schedule Play is free and available to all TopDog users. More information on Schedule Play.